The United Kingdom – surprisingly and foolishly in my opinion – voted to exit the European Union yesterday. 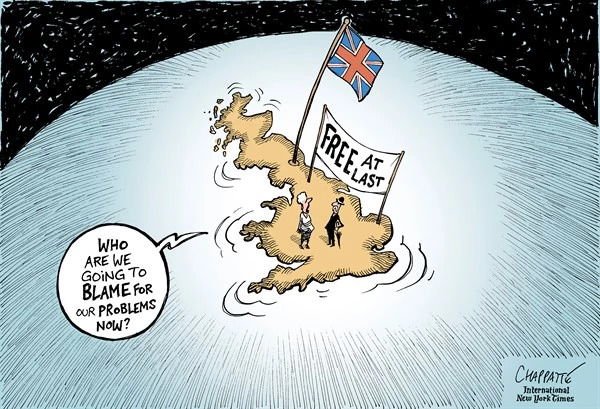 Brexit – dutifully dubbed by the acronym loving media – will have wide-ranging effects on multiple continents and countries – including right here in the USA. One of the biggest, and most immediate, effects for Americans is how it will change mortgage interest rates. In fact, the positive change in rates can already be felt – for now. In the typical “flight to safety” reaction by international investors, they moved assets from flailing equity markets in the UK, Eurozone and the USA to safer investments with far less downside (and also limited upside). Investments like US Treasuries and Mortgage Backed Securities (MBS) are the primary targets for flight to safety investors. Treasury yields had already dropped by Friday morning which reflects an increase in price due to higher demand. Mortgage Backed Securities (MBS) – whose trading is the primary driver of mortgage rates – tell a similar story. They experienced nearly 60 basis points improvement as of early this afternoon. Historically, 60 basis points correlates to about 1/8th of a point lower for interest rates – that’s held true today. The gains may not last though. In fact, they may not last even to Monday. While mortgage rates will not go up substantially anytime soon, we may not see rates like today for some time. I do believe that it’s an exaggerated reaction and that the market may stabilize a little bit more in the coming weeks. In other words, you probably want to lock today or – to use an old English adage – suffer from looking a gift horse in the mouth. This 2016 mortgage rate prognostication deal just got a little trickier. The FED had previously indicated a rate hike was imminent. Those generally drive mortgage rates up. However, with Brexit related pressure on the US equities market and global economy as a whole, it seems highly unlikely we’ll see a FED rate hike anytime soon. Surely not in 2016? Afterall, the objective of the FED is to keep the economy at a reasonable growth rate without incurring the wrath of inflation. Rent is at a seven-year high and gas prices are inching upward. These are usually the tell-tale signs of inflation and signs that a FED rate hike is needed, but are they in this current economic environment? Increased rents can be more easily traced back to lack of housing supply. Afterall, builders took a 6+ year break in building new units during the crash. Immigration policy has led to the deportation of quite a few of the skilled laborers they used before the crash too. Despite the effort of builders, they don’t have the workforce so the inventory issue isn’t going to be solved anytime soon. Expect rents to continue their march upward – not because of inflation, because of supply. What about the uptick in gas prices? Inflation? In constant dollar terms, the price of gasoline in 2015 was only seven cents higher than in 1929. By 2016 it was lower than the cost of gas throughout the better part of the last 80 years – including 1929 and the early 1970’s gasoline heyday. Doesn’t sound inflationary to me. Sounds like a typical market correction that’s partially driven by seasonal demand and the strength of the dollar encouraging more travel and therefore the use of more gasoline. The British pound and the euro have been sliding in value against the dollar in recent days due to Brexit and that is something to watch as it also drives the cost of American exports up – potentially making them unaffordable and decreasing demand abroad. That comes with American job implications among other potential negative side-effects like decreased corporate earnings for international companies. The latter pulls the DOW down, but a stronger dollar also keeps a lid on “imported” inflation, which makes the case for a rate hike by the Federal Reserve less compelling. A stronger dollar means that your European vacation just got a lot cheaper too. All in all, I think that rates will stay lower than I had previously anticipated throughout 2016 while the world tries to sort this UK exit from the European Union out. Speaking at a seminar in 2009, I spoke about a “decade of low mortgage rates”. We are in year 8 already and I don’t see any reason how the rates will climb up anytime soon. Mortgage rates will probably not stay as low as they are today, but I doubt we will see the average conforming mortgage rates with a 4 as the first number anytime soon.